It's raining outside since I got up this morning. I have nothing to do much today so I decided to take time to search about cucumber. I know a lot of people like cucumber. I like cucumber a lot too. When I was in my country Philippines I ate a lot of cucumber because my aunt has planted a lot of cucumber and they always give us. I hope the information here will help expand your research.According to new world encyclopedia Cucumber is the common name for a widely cultivated creeping vine, Cucumis sativus, in the gourd family Cucurbitaceae, characterized by large leaves, thin tendrils, and a typically elongated, green-skinned fruit with tapered ends. The term also is applied to the edible, cylindrical fruit of this plant.In advancing their own individual purpose of continuation as a species, cucumbers also provide value for humans. They are eaten raw or cooked, or they can be pickled, providing a nutritional food source. In turn, humans have spread their cultivation, over the past 3,000 years, from Asia to Europe, Middle East, Africa, and the Americas, and have created numerous varieties. Cucumbers also serve as a source of food for insects and other animals.Several other plants also utilize "cucumber" as part of their common name, such as the squirting cucumber, Ecballium elaterium. In the United States, wild cucumber refers to Manroot (genus Marah).According to wikepedia The cucumber (Cucumis sativus) is a widely cultivated plant in the gourd family Cucurbitaceae, which includes squash, and in the same genus as the muskmelon.Botany -The cucumber is a creeping vine that roots in the ground and grows up trellises or other supporting frames, wrapping around ribbing with thin, spiraling tendrils. The plant has large leaves that form a canopy over the fruit.The fruit is roughly cylindrical, elongated, with tapered ends, and may be as large as 60 cm long and 10 cm in diameter. Cucumbers grown to be eaten fresh (called slicers) and those intended for pickling (called picklers) are similar. Cucumbers are mainly eaten in the unripe green form. The ripe yellow form normally becomes too bitter and sour.Having an enclosed seed and developing from a flower, cucumbers are scientifically classified as fruits. Much like tomatoes and squash, however, their sour-bitter flavor contributes to cucumbers being perceived, prepared and eaten as vegetables, which is the accepted culinary term citation needed.Various myths have arisen with regard to how bitterness may be removed from cucumbers. Among these myths includes slicing off the ends of a cucumber, and rubbing the now-exposed ends of said cucumber with the sliced-off ends until it appears to froth. Another such urban legend states that one ought to peel a cucumber away from the end that was once attached to a vine, otherwise one risked spreading the bitterness throughout the cucumber. Flowering and pollination - A few varieties of cucumber are parthenocarpic, the blossoms creating seedless fruit without pollination. Pollination for these varieties degrades the quality. In the US, these are usually grown in greenhouses, where bees are excluded. In Europe, they are grown outdoors in some regions, and bees are excluded from these areas. 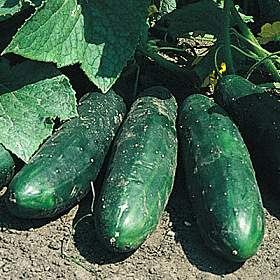 Most cucumber varieties, however, are seeded and require pollination. Thousands of hives of honey bees are annually carried to cucumber fields just before bloom for this purpose. Cucumbers may also be pollinated by bumblebees and several other bee species.Symptoms of inadequate pollination include fruit abortion and misshapen fruit. Partially pollinated flowers may develop fruit which are green and develop normally near the stem end, but pale yellow and withered at the blossom end.Traditional varieties produce male blossoms first, then female, in about equivalent numbers. New gynoecious hybrid cultivars produce almost all female blossoms. However, since these varieties do not provide pollen, they must have interplanted a pollenizer variety and the number of beehives per unit area is increased. Insecticide applications for insect pests must be done very carefully to avoid killing off the insect pollinators. History - Cucumbers originated in India.Therefore, the English word cucumber is derived from Indian word "kachumbar". Large genetic variety of cucumber has been observed in different parts of India. It has been cultivated for at least 3,000 years in Western Asia, and was probably introduced to other parts of Europe by the Romans. Records of cucumber cultivation appear in France in the 9th century, England in the 14th century, and in North America by the mid-16th century. For more information about cucumber check this http://en.wikipedia.org/wiki/Cucumber.